"Something wrong has taken place. Three energy bodies of religions (serpents) have become one and ran away to the sea. It went out of Hayama-town in Kanagawa Prefecture, Japan." （The family of the Imperial Household recuperated in Hayama-town the other day. Today the wall looked like the golden stitch shape for the first time in a long time. According to my experience, those shapes were seen when energy body of religions came. ＃）Let me correct some of the description about Neu which was described before. Though it has claimed Neu as Neutrino is the smallest unit which form the material,it is the thoughts which hate to get solidified as atoms= It is the presence which was made when the consciousness pops out of the atom. Therefore they can't turn into the material however much they might gather together. Atoms can turn into the material when electrons turn around nucleus by playing tag. However I was told Neu which has only thoughts can't turn into material. That means human beings can't catch it as Neu has no mass. The report from a reader of my site. "The orbs made of intense light have been captured by digital camera since the other day. Three or four small ○ were captured in the round orbs and small ○ were lining up in the form drawing an arc. Only the position around the small circle is recessed and can be seen clearly. However many photos might be captured, the shape which show there are circles in the circle is the same as before though they came to become paler . I have never seen such images. Furthermore intense pure white orbs have been captured when I tried to take pictures by ordering to come out with the fighting spirit. Is it the impact of Star Festival ?" The illustration of starange orbs. As is shown by the above clouds, those which are informed by the matters accidentally have the big meaning. The orbs or clouds have the following meaning. Even though Stone gods, Mercury　or the atoms from the sky and the universe try to extinguish the energy bodies of religions, there are strong walls（buildings）and their power can't be reached those energy bodies because they are inside the buildings. （I had the signal in the front teeth, which means what was told now is true. As is told in the announcements from the stars given the other day in my site, energy bodies of religions can't be extinguished, becayse each religion resides in the giant buildings and it seems to be hiding inside of them. In the period of long ago, the energy bodies of religions were extinguished by the "the Giant Deluge of Noah". A reader sent me the illustration of orbs which was reported in the announcement of my site today. She told me all the images in the digital camera were deleted. It looks like the strange lights which drew an arc that was shot in the US and reported in 'earth file'. ＊ ）The news which report the strange lights drew an arc and were shot in Phoenix in US　appear today. Jan. 29, 2007 in Los Angeles of the US. 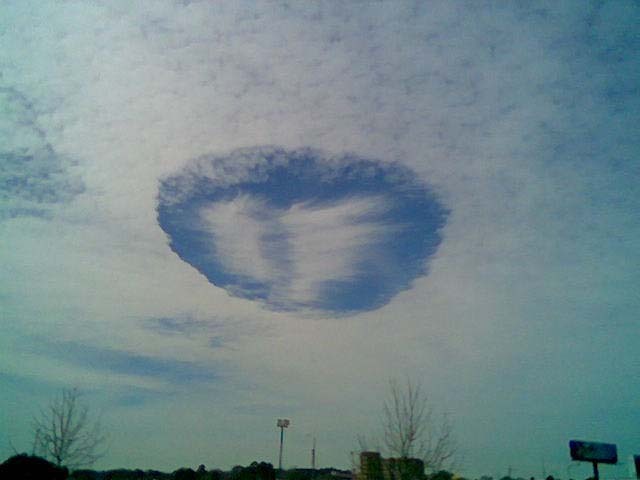 The hole punch cloud was seen in 2004, too. Many things seem to be informed by chance but they have big meaning. The meaning of orbs and clouds is explained in the following. "It expresses the strong wall(building) prevents the energy bodies from being erased even though Stone gods, the beings of Mercury or the beings from the sky try to erase the energy bodies of religions. The long and short of it, the impact of them don't reach inside of the buildings." （I got the signal in the front teeth.= It means it is true. Mercury and the beings from the sky told me through the channeling that they can't erase the energy bodies（serpents） of religions because they are protected by the buildings which was written in the announcement in my site. Many religions have the huge buildings and those energy bodies are hiding inside the building. "The Giant Deluge of Noah" was caused and erased the energy bodies of religions long ago. "I'm looking that someone is washing the huge bathtub." The meaning of the above dream is as follows. "Stone humans did the same thing as was seen in your dream. You saw the dream to show the appreciation to Stone humans. The dream show Stone humans took care of human beings."